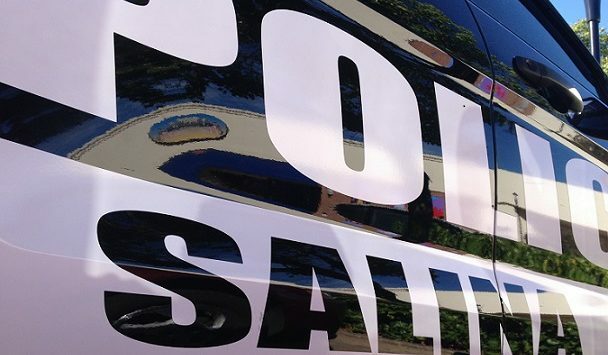 Just after 6:00 Sunday night Salina dispatch received a call reporting a domestic in progress at a home in the 500 block of Cloud. When Police arrived on scene the victim, a 38 yr. female, reported the couple was involved in a verbal argument that turned physical. Her boyfriend, Travis Vass (32) of Salina, allegedly spit in her face, punched a hole in the wall ($25), broke the female’s Samsung phone ($50), ripped the wig she had been wearing ($300) and strangled her. Travis Vass was arrested on scene and will be charged with Aggravated Domestic Battery, Domestic Battery, and Criminal Damage to Property.